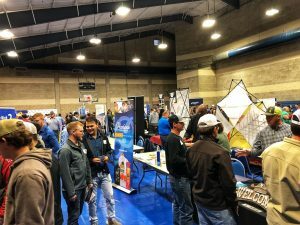 (WACO) – More than 850 Texas State Technical College students met potential employers from throughout Texas on Thursday at its Industry Job Fair. Students were lining up to register about an hour before the 9 a.m. start of the event at the Murray Watson Jr. Student Recreation Center. Inside, students were treated to more than 100 companies looking to fill jobs for computer-aided drafters and designers, industrial maintenance technicians, aircraft mechanics and other technically skilled positions. KEI Medical imaging Services of Hutto was appearing at its first TSTC job event. Gordon Schoppe, the company’s president, was on the hunt for Biomedical Equipment Technology majors. He said the kind of job candidates he likes are those who enjoy doing something different daily and long workdays. The company provides parts and servicing on specific brands of MRI machines and CT scanners, along with inspections and insurance consultations. Schoppe said the business has about 10 employees. SpawGlass, which has nine offices in Texas, was also making its first visit to TSTC in Waco. Lloyd Faver, a project executive at the construction company’s Fort Worth office, said he was looking for students interested in 3D design and all facets of building construction. “I feel like the students at TSTC have more hands-on experience,” Faver said. Some TSTC alumni worked at information tables, ready to talk to students about their professions. Zachary McLeskey, a junior assistant superintendent at Galaxy Builders Ltd. in San Antonio, graduated in December 2017 with an Associate of Applied Science degree in Building Construction Technology. McLeskey learned about the company at a TSTC Industry Job Fair. He began work at the construction company in January. His advice to students was simple. “Maturity goes a long way in connecting with employers and clients,” McLeskey said. Students asked questions, clutched company brochures and handed out resumes to company representatives. Isaac Mendez, 18, of Mexia is in his first semester in the Diesel Equipment Technology program. He attended the job event to see what it was like. Andrew Betts, 19, a fourth-semester Welding Technology major attending TSTC in Williamson County, traveled with a small group of students and a staff member to the job fair. Betts, from the Brushy Creek area of Williamson County, was interested in welding jobs. This entry was posted in Waco on October 18, 2018 by Daniel Perry.